The annual Physical Problems of Mineral Processing Symposium celebrated its 50th anniversary early this month, and this year’s event was dedicated to Prof. Janusz Laskowski, the founder of the symposium and the journal bearing the same name. This year’s event held in conjunction with the 18th International Conference of Minerals Processing (MEC 2013) and was attended by 132 delegates, 23 from outside Poland. MEI was a media sponsor for the event, and the organisers have sent me these photos, to supplement the full report, which can be found on MEI Online. Good news in from World Gold '13, which finishes today in Brisbane. 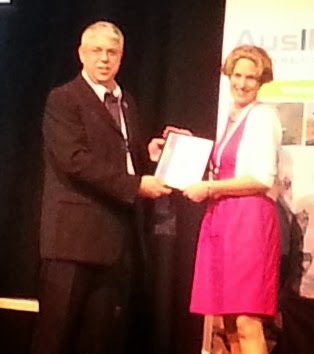 MEI's Process Mineralogy '14 consultant Megan Becker was yesterday presented with an award for the best presentation by a young person at the conference. Her paper Use of mineralogy to interpret laboratory-scale acid rock drainage prediction tests - A gold case study, was co-authored by two other MEI consultants, J-P Franzidis (Flotation '13) and Sue Harrison (Biohydromet '14). The other two University of Cape Town co-authors were N. Dyantyi and J.L. Broadhurst. Megan will be reporting on Geomet 2013 which starts tomorrow in Brisbane. As water resources become scarcer and society’s demands to reduce freshwater extraction have increased, mine sites have been increasing water reuse and accessing multiple water sources for mineral processing to save freshwater, particularly in froth flotation. Implementation of either strategy may lead to water quality variation that may impact flotation efficiency. 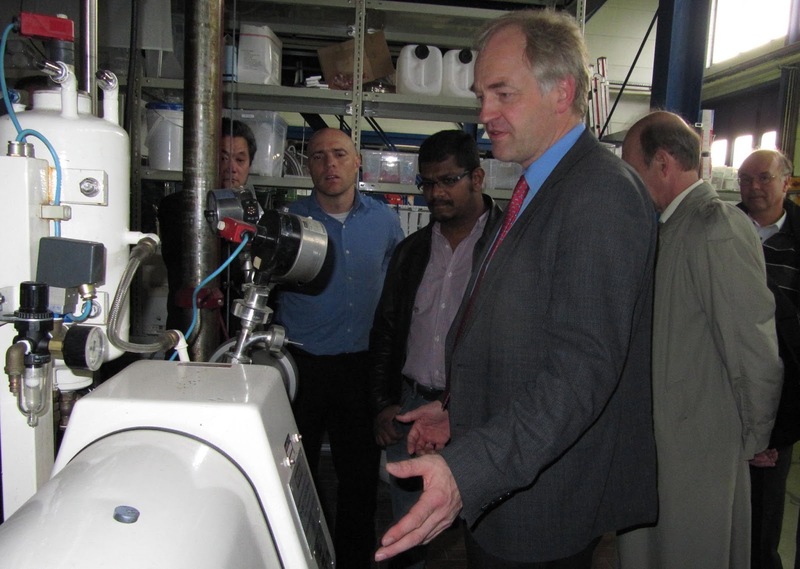 In general, flotation is most effectively undertaken with clean water. As a second preference, metallurgists seek a consistent water quality so that reagent regimes for flotation can be developed and applied consistently. Variation in water quality is undesirable because it could complicate operating conditions and compromise flotation performance. This is all discussed in an excellent review of the effect of water quality on flotation, published in Minerals Engineering, by researchers at the Sustainable Minerals Institute of the University of Queensland. More and more flotation plants have to use groundwater, sea water and recycle water with a high concentration of electrolytes. Despite a number of studies that have been conducted to investigate the effect of saline water on mineral flotation, effective ways to solve many problems encountered in mineral flotation plants using saline water are not currently available. Other University of Queensland researchers will present a review at Flotation ’13 of published articles addressing the effect of saline water on the interfacial phenomena taking place in the flotation process, such as surface wettability, bubble-particle collision and attachment, mineral particle interactions and frothing. They will provide an overall picture of current status of studies in this area and pinpoint directions of future researches addressing different problems associated with using saline water in mineral flotation. Flotation '13 is only seven weeks away now. The updated timetable can be viewed here, and the current list of delegates registered here. 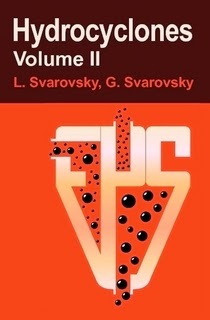 Ladislav Svarovsky’s book Hydrocyclones was published in 1984 and quickly became the leading teaching text for this ubiquitous device. Now, almost three decades later, the second volume has been published, updated to take into account further developments and research. If any one “out there” has a copy of the new volume, your comments and views would be appreciated. World Gold '13 starts tomorrow in Brisbane. MEI consultant Dr. Mike Adams will be reporting and it will be interesting to see what the general mood is, and how delegate numbers have been affected by the fall in gold price over the past year. Mines all over the world have suffered, but perhaps none more than those in South Africa. South Africa's gold mining history began in the late 19th century, with the discovery of relatively small deposits in Mpumalanga (see posting of September 21st), but when the prospector George Harrison discovered the outcropping Witwatersrand reef on Langlaagte Farm in 1886 it heralded the dawn of a long era in which gold mining and South Africa would become synonymous. Although incredibly rich, the goldfields were from the start difficult to mine, requiring deep shafts and high capital investments. Experts in deep mining were drafted in, notably from Cornwall, whose tin mines at that time were the deepest in the world. The shift of economic dominance from the British Cape to the Boer Republic of the Transvaal made gold the catalyst for the Anglo-Boer War and the eventual formation of the Union of South Africa. South Africa dominated world gold supply throughout the 20th century. I remember that in my early days at Camborne School of Mines virtually every graduate was snapped up by the South African gold mining companies, and I often look back and wonder how the press did not get wind of the fact that this small mining college in the remote south-west of England was training and supplying British students for the Apartheid regime. In 1970 80% of global gold production was from South Africa. Now it produces only 6% of the world's supply. Only a decade ago South Africa was the world's number 1 producer, now it ranks only 6th, behind China, Australia, USA, Russia and Peru, with Canada set to overtake within the next few years at the current rate of decline. It looks highly unlikely that gold will ever again dominate South African mining. The mines are old and deep and reaching the end of their economic lives, and there is little incentive for massive capital investment. The gold and PGM mines are facing increasingly violent labour disputes, with demands for very high wage increases stimulated by inter-union rivalries. Unfortunately nothing lasts for ever. Cornwall was once the world's largest producer of copper and tin, but now not a single copper or tin mine survives in the county. Coal was once king in Britain, but all that ended with Margaret Thatcher in the mid 1980s. Coal is now king in South Africa in terms of annual sales value, with platinum second and gold languishing 4th behind iron ore. The decline of the highly labour intensive gold (and platinum) mines must be a cause for great concern for South Africa, where metals and minerals contribute greatly to export earnings and gross domestic product. Mineral processing legend Prof. Alban Lynch recently forecast that comminution would be the most important area for mineral processing this century. There is certainly a lot happening in this field, with equipment and circuits evolving rapidly. 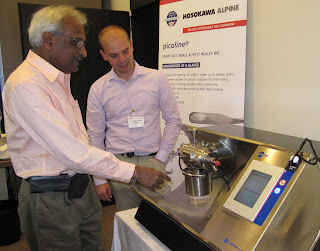 At the recent ESCC ’13 in Germany it was interesting to see the ultrafine grinding machines that are used outside the mining industry, but which may feature in future fine grinding circuits. Next year’s Comminution ’14 in Cape Town promises to be the biggest in the series, with 22 major companies already providing corporate support. 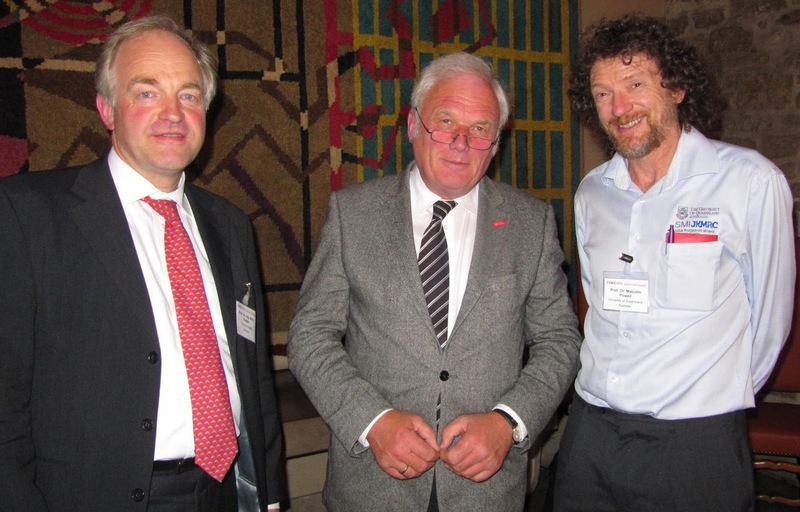 We expect a large international audience, mainly from the minerals industry, but hopefully also from other industries who can bring fresh ideas to the meeting. Prof. Tim Napier-Munn, formerly Director of Australia’s JKMRC, will present the first keynote paper “Is progress in energy-efficient comminution doomed?” and Alan Muir of AngloGold Ashanti, South Africa will present the second keynote “The next stage of evolution in comminution”. There is now a final call for abstracts for the conference. Abstracts should be submitted by the end of October. 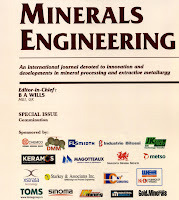 All accepted papers will be published in draft form in the conference Proceedings, and after the conference all authors will be invited to submit final papers for peer-review for a special comminution issue of Minerals Engineering. Registration for the exhibition has been open for some time. There are only 4 booths available at the moment, so if you would like to exhibit, please register as soon as you can. 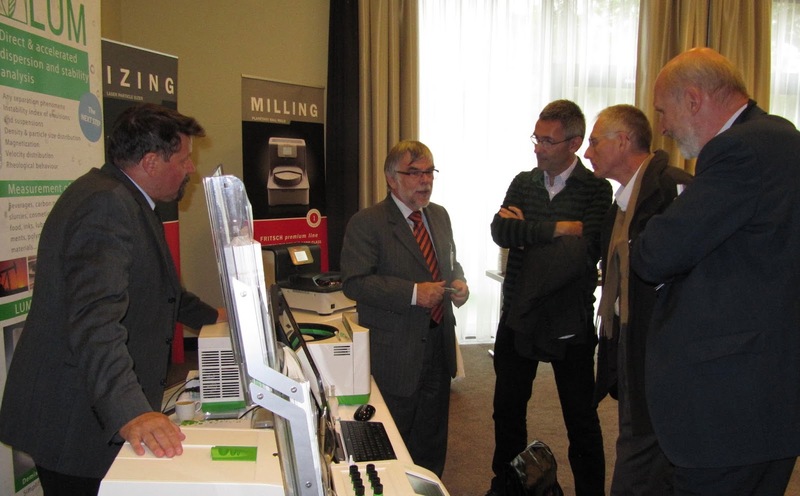 Flotation '13 starts eight weeks today, and already over 100 delegates are registered. The delegate list is now available for viewing, and will be updated regularly. There is a lot on offer during the week, including workshops and a guided hike up Table Mountain, so make the most of your time in Cape Town. 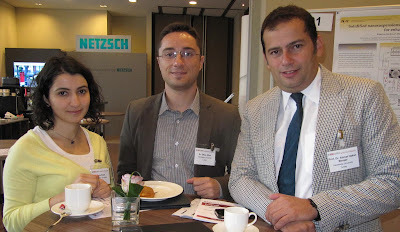 We expect a lot of young researchers at Flotation '13, many of whom will have been encouraged to attend by our consultants Profs. Dee Bradshaw and J-P Franzidis. Only a week ago Dee was presented with an award for her work with young people in our industry. 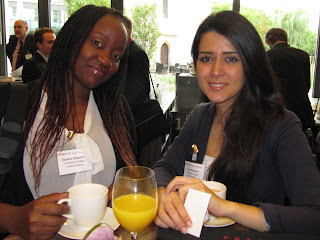 It is also encouraging to see that one of our sponsors, Outotec, is keen to nurture young talent. The company will be judging papers presented by students at the conference, and will be awarding a prize to the presenter of the best paper with a 1000 Euro scholarship. In addition to the award for the best paper Outotec will evaluate all the papers and posters presented at the conference and invite the authors of four of the most interesting for further discussions in the form of a dinner during the conference. 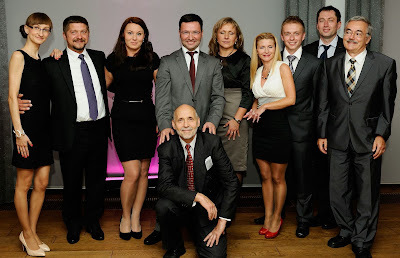 The dinner will be a great chance for the students to meet and mingle, network and discuss with representatives from one the industry's technology leaders. It is great to see companies such as Outotec developing young talent in this way. It is not the first time that the company has done this in Cape Town. 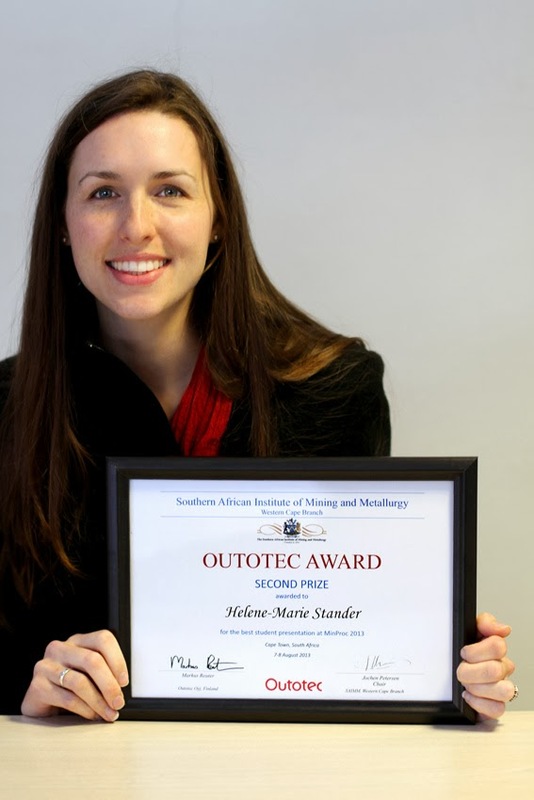 At last month's SAIMM Western Cape "MinProc" conference, essentially a student conference, Outotec's Prof. Markus Reuter, MEI's SRCR '14 consultant, adjudicated and awarded the Outotec "Sustainability in the Mineral Industry" prizes. 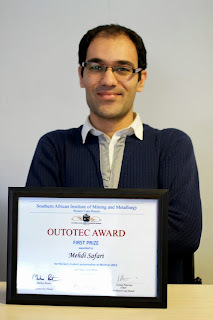 First prize of R10k went to Mehdi Safari from the University of Cape Town (UCT) for his presentation/poster on "The effect of energy input on flotation kinetics of sulfide minerals in an oscillating grid flotation cell (OGC)". 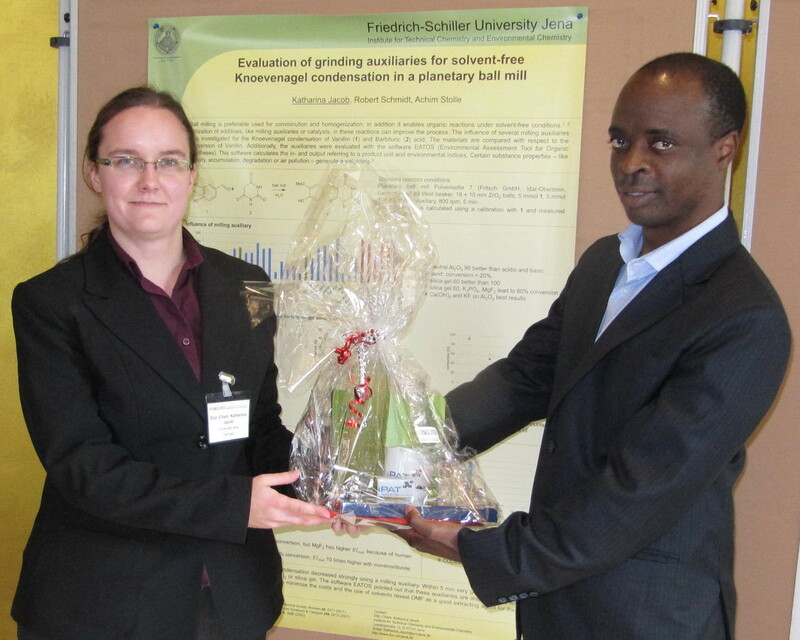 Second prize went to Helene-Marie Stander, also of UCT, for her presentation/poster on "Evaluation of down-stream processing options for sulphide-rich coal waste tailings". 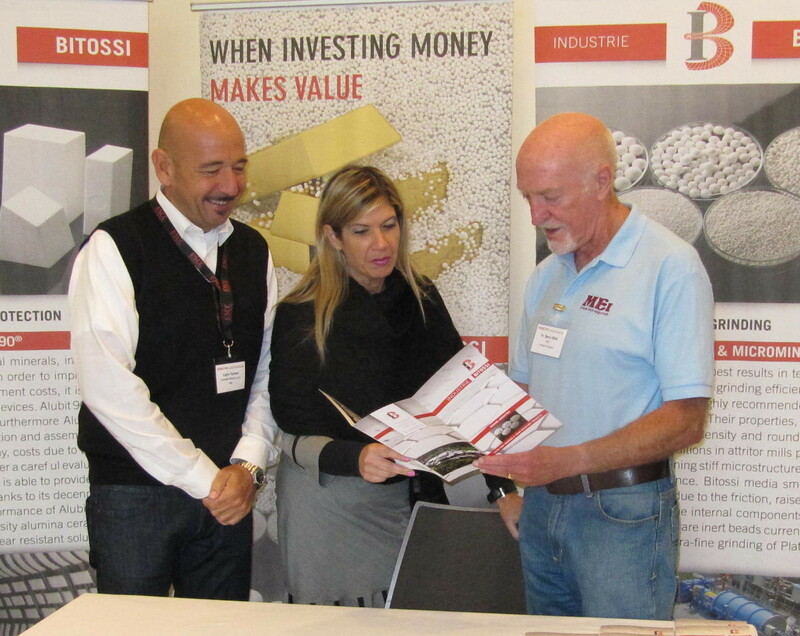 The recent Base Metals '13 conference was held in Mpumalanga province, east of Johannesburg, and the area where gold mining really began in South Africa. On the day following the conference, Barbara and I headed north to Sabie and then on to Pilgrim's Rest, a restored gold mining town which has its origins in South Africa's first gold rush. Peaceful and photogenic now, in 1873 1500 diggers worked 4000 claims in gruelling and unhygienic conditions. Many of them died from malaria and dysentery after arduous treks through the Lowveld, some passing over the giant gold reef which slumbered under their feet, and would be woken a decade later. On the following day we drove south, through Nelspruit to Barberton, set in a basin surrounded by the oldest mountains in the world. The Mkhonjwa Mountains date back 3.5 billion years, with some of the oldest exposed rocks, volcanic in origin, known as the Barberton Greenstone Belt. A bacterial micro-fossil, the first form of life on earth, was found here and has been identified as being 3.2 billion years old. 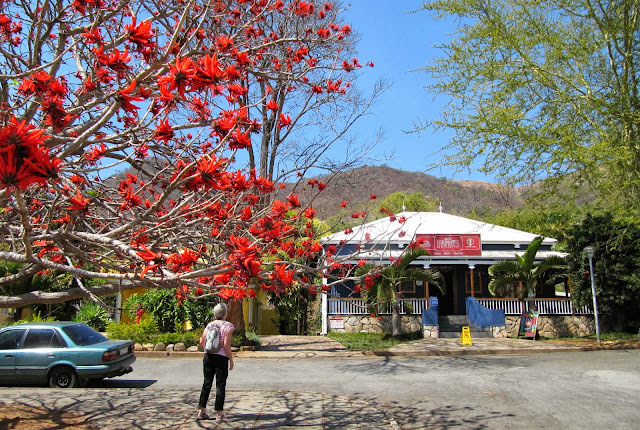 Gold was found here in 1883, and in 1884 Graham Barber discovered an incredibly rich gold reef, which created the famous 'Barberton boom' as miners flocked to the area. Gold was also discovered in the hills above Barberton, and in 1885 the Sheba Reef Gold Mining Company was formed. The Sheba mine is still in operation, the oldest and richest gold mine in South Africa. However Barberton flourished for only a brief period, as in 1886 the Australian prospector George Harrison stumbled upon the giant Witwatersrand gold-bearing reef, which made all other deposits pale into insignificance. The miners moved on to the new town of Johannesburg, and South Africa's 20th century world dominance in gold mining had begun. There was a fairly low turnout at last night's sundowner at Falmouth's Chain Locker pub. 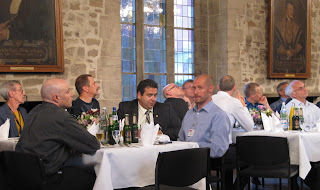 No surprise guests this time, but nevertheless a good evening of conversation, despite a touch of autumn in the air. It was interesting to talk about the discovery of gold at the abandoned South Crofty tin mine, and national news reports that the profits would be split between the Queen, and Prince Charles, the Duke of Cornwall. I think the chances of South Crofty ever becoming a working gold mine are as remote as me taking over from Daniel Craig as the next James Bond! In the photo below are Paul and John (sorry do not know surnames), mineral processors with FLSmidth, me and Barbara, Flee and Nick Wilshaw of Comminution '14 sponsor Grinding Solutions, and biohydrometallurgist Dave Dew. The next sundowner is on October 24th. When MEI appointed, several years ago, Prof. Dee Bradshaw as consultant to our flotation series of conferences, it was not only because of her work in flotation research, but also for her passion for nurturing students in this field. Now her energies have been rewarded and last Tuesday evening at the annual University of Queensland Research Week Awards, Dee was presented with an Excellence in Research Higher Degree Supervision Award, for her ability to develop young researchers for careers in the mining industry (see full story on MEI Online). 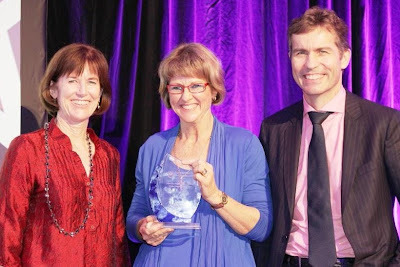 She is pictured below with UQ's President and Vice-Chancellor Prof. Peter Høj and awards ceremony guest speaker Prof. Robyn Owens from The University of Western Australia. Dee, of the University’s Sustainable Minerals Institute, has an impressive success rate with her students, many of them now in leading roles in the sector. She is a natural talent and tells a great story in a short video of what she calls ‘Living Gold’, the process where she unearths the natural ability in her minerals students to bring out their potential. I first met Dee 22 years ago when she herself was a mature post-graduate student at the University of Cape Town. 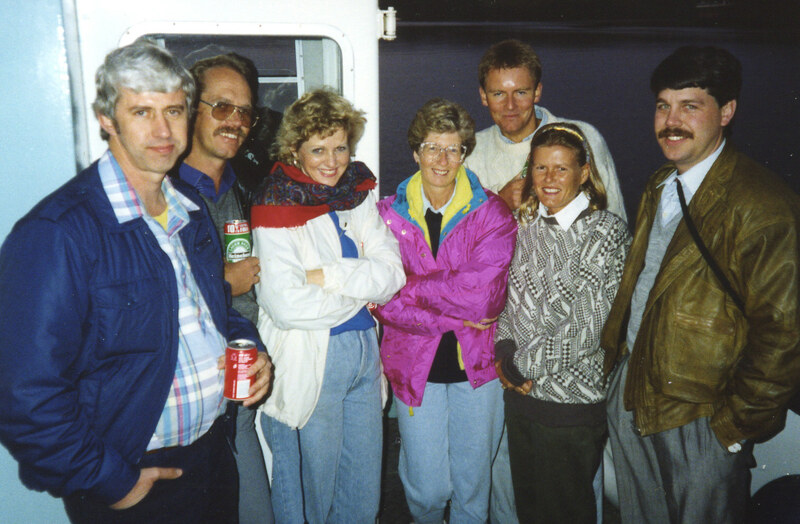 Her first international conference was in Cornwall for Reagents in Minerals Engineering in September 1991, and she is 3rd left on the photograph below, together with a few other familiar faces. Many congratulations once again Dee. I saw this photo yesterday on Facebook. It is taken at Botallack near Land's End, one of the most photographed and painted spots in Cornwall. It shows the two famous 19th century Crown Mines engine houses situated precariously on the cliffs, exposed to the full force of the Atlantic Ocean. 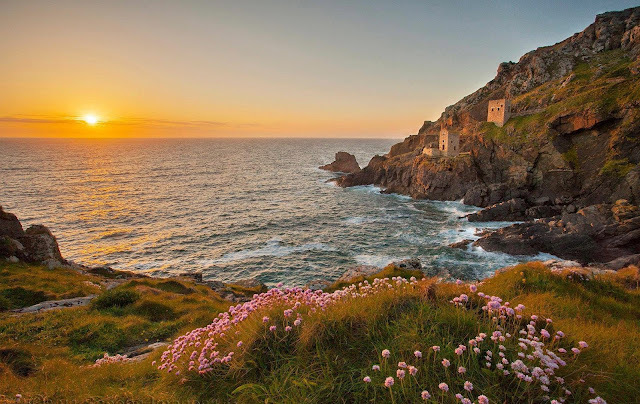 I have photographed Botallack many times, and can only wish that this photo was one of mine, but it isn't. I don't know who the photographer is, but he or she has captured Cornwall at its best. 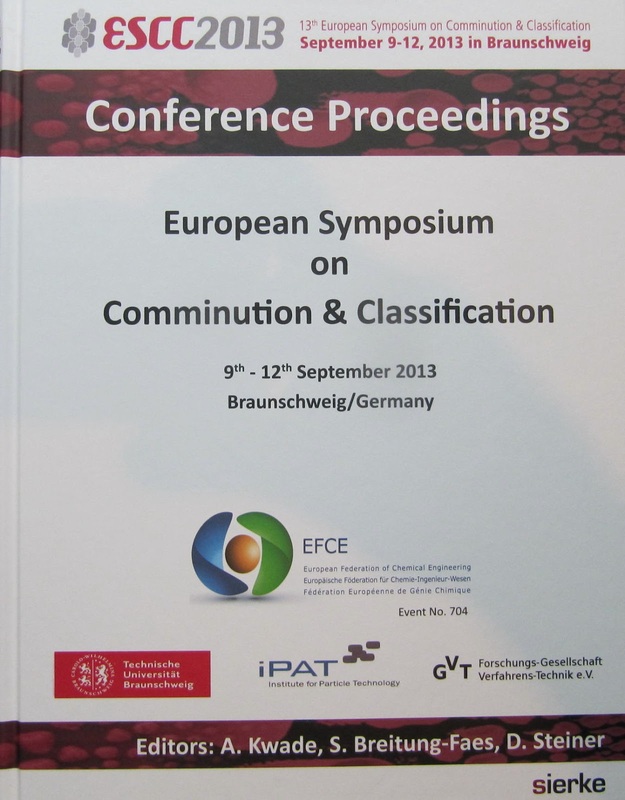 The 13th European Symposium on Comminution and Classification (ESCC '13) was held from September 9th-12th at the Steigenberger Parkhotel in Braunschweig, an old German city south of Hamburg, with a long international history and the highest density of researchers in Europe. It was held immediately following a workshop of the International Comminution Research Association (ICRA) and a short course on fine grinding in stirred mills. Papers for all these themes, presented in 67 oral and 56 poster presentations, have been published in a hard back Proceedings by sierke Verlag (ISBN 978-3-86844-551-0). Due to its wide ranging scope I would highly recommend this publication, which gives insights into how comminution is performed outside your own particular industry. 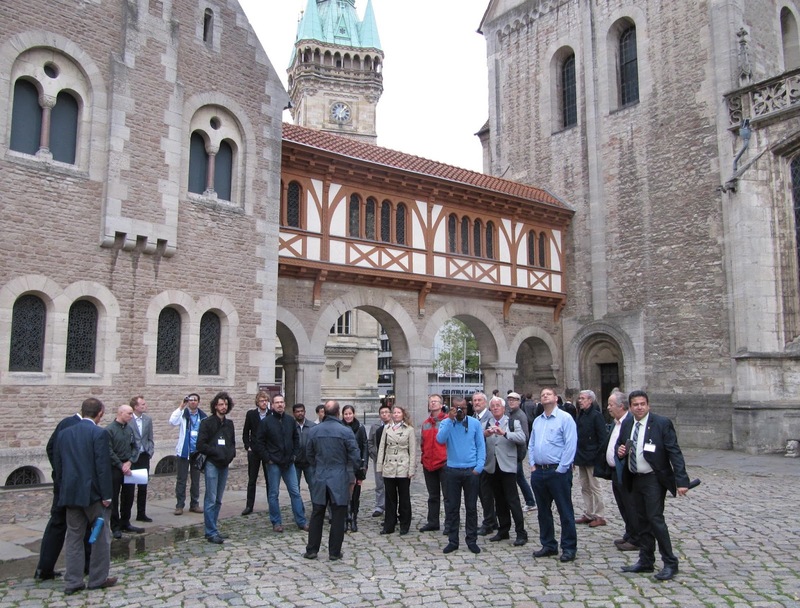 Chairman of ESCC '13 Prof. Arno Kwade, head of the Institute of Particle Technology, TU Braunschweig, welcomed the 190 delegates to the conference this afternoon. This is very much an international event, with 26 countries represented, many outside Europe, with a sizeable contingent from Australia, Brazil, Canada, Egypt, India, Ireland, Israel, Korea, South Africa and USA. 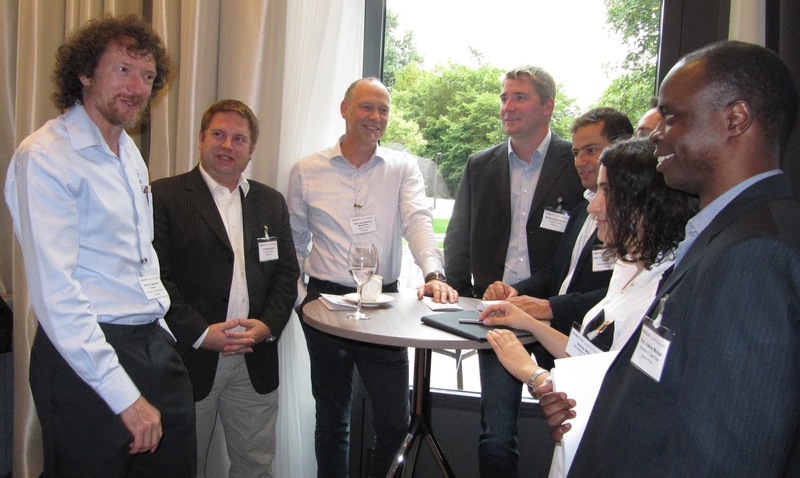 A welcoming cocktail reception then followed a keynote speech from Bernd Sachweh of BASF SE, Germany, who discussed the status of online measurement methods for particle systems. The day began with a keynote presentation by Norbert Stehr of STEHR empCONSULT, Germany, on the progress of industrial wet processing with agitated bead mills. Continuing research in academia and industry has been providing an increasingly deeper understanding of agitated bead milling, including the identification of key parameters in view of specific process targets. The morning's sessions included High Pressure Grinding Mills, which in recent years have become increasingly used for hard rock applications. The benefits are relatively low energy consumption with improved wear performance. Also improved recoveries have also been reported, especially for leaching operations. ThyssenKrupp is a sponsor of ESCC, as well as of Comminution '14, and Ulrich Voss described an advanced model for HPGR comminution, implemented within the JKSimMet flowsheet simulating software. A paper from Hacettepe University, Turkey's premier mineral processing institute considered the effect of recirculating load on HPGR performance. There were three papers presented in a session on Vertical Mills, with interesting work on energy based comparisons of vertical roller mills and tumbling mills, and descriptions of ore grinding practices. After the lunch break, Comminution '14 consultant Malcolm Powell, of Australia's JKMRC presented a keynote lecture on how mechanistic modelling and multi-component process simulation are pushing the boundaries of comminution. 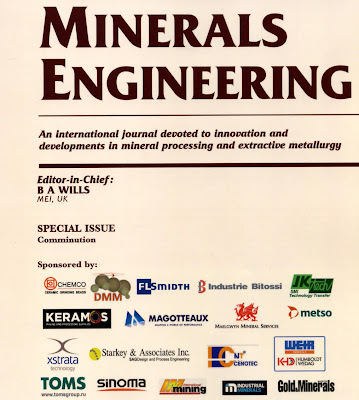 In addressing the requirements of processing new types of ore bodies with far tighter constraints within an uncertain market, conventional circuits operated at historic efficiencies are not going to address the challenges of the industry, and Prof. Powell proposed a new approach and the tools required, the focus being on comminution circuit design. Comminution machines and circuits are certainly evolving rapidly and this afternoon's session was the first of two sessions highlighting new technologies. What I particularly like about ESCC is its multi-discipline approach, bringing ideas from an apparently unrelated industry into one's own domain. Stirred mills, for instance, have been used for several decades in industries such as paints and pigments, but systematic application for hard rock minerals is relatively recent. Several factors have been influential, such as the demand for better energy efficiency in fine grinding of complex, low grade ores. Ilesh Shah, of FLSmidth, USA, dealt with one such application, the onsite testing of a VXP2500 FLSmidth Vertical Mill (originally the Knelson-Deswick mill) for reprocessing of older mill tailings. Chris Martin of RSG Inc., USA then discussed the operation of a dry vertical air-swept mill operated with mixed grinding media sizes, and the effect on grinding efficiency and ultimate product size compared with mono-sized media. It was found that the use of mixed media within the vertical agitated mill allows for the production of finer particle sizes when processing industrial minerals such as calcium carbonate and wollastonite in the range of 1-3 microns. 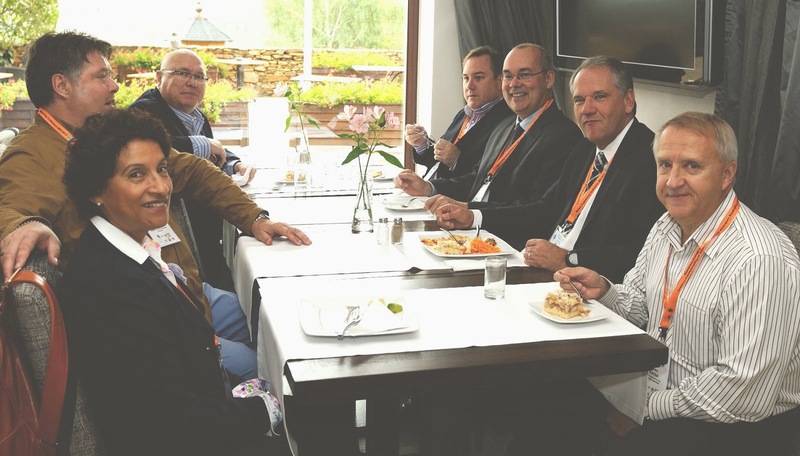 South African company Dakot Milling Media (DMM) last week became the 21st sponsor of Comminution '14, and Hanlie Kotze of DMM discussed the results of testwork on two laboratory stirred mills, an M4 Netzsch horizontal mill and the DMM Vertical Laboratory Mill, to assess wear behaviour. It was observed that when comparing wear results for different media, the variability of the test method, which can be substantial, needs to be taken into account. 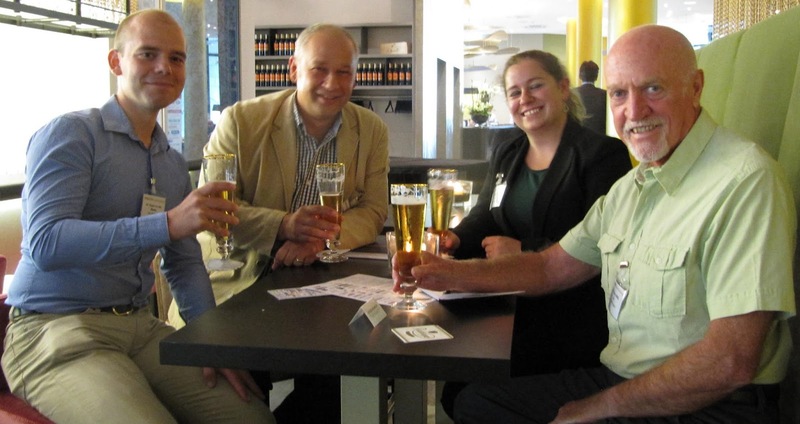 The IsaMill is now established, rather than new technology, but the session ended with a presentation from Katie Barns of Xstrata Technology, Australia who showed how the IsaMill has developed from the stirred milling technology of Netzsch Feinmahltechnik GmbH in the 1990s. The benefits of fine grinding in the IsaMill are now being applied at increasingly coarser grind sizes, and to a diverse range of minerals, a remarkable transition from the original small-scale applications. It was good to see many young researchers presenting papers in this afternoon's poster presentations, including two post-grads from my old university, the University of Leeds, Sandra Chauruka and Tina Bonakdar. A very interesting first day ended with a guided walk through this beautiful old city, culminating in an excellent dinner at the magnificent ancient city hall. The first two parallel sessions of the morning, Fine Grinding and Dispersing, and Crushing, each contained three papers. 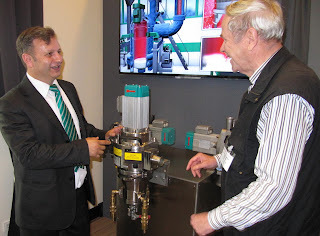 Of particular note was a presentation by Hamid Manoucheri of Sandvik Mining, Sweden, who introduced the Vibrocone, a new crusher claimed to be a breakthrough in comminution technology. As crushers are more energy efficient than grinding mills, fine crushing is preferred to coarse grinding. According to the paper the Vibrocone is the next generation in crushing technology, combining the best of the conventional cone crusher mechanism with a grinding action in order to produce unprecedented amounts of finely crushed material. Particles are crushed not only between the liner surfaces in the crushing chamber but also to a high degree by each other in a high pressure inter-particle crushing action. This allows the omission of coarse grinding, resulting in reduced water and energy consumption. I look forward to hearing more of this at Comminution '14. There are areas of overlap between ESCC'13 and Comminution '14, and Italian company Industrie Bitossi, who supply ultrafine grinding and wear resistant products, are well aware of this, being sponsors and exhibitors at both events. After the morning coffee break, Classification and Separation of Minerals ran in parallel with a session on Pharmaceuticals. Collaboration between organisations and countries is always good to see, and MEI Consultant Aubrey Mainza presented a paper this morning which took collaboration to its limits, with a paper on the role of classification in comminution circuits co-authored by workers from the University of Cape Town, Anglo American Platinum, Gold Fields and Lonmin of South Africa, Chalmers University of Technology, Sweden, Hacettepe University, Turkey, Universidade Federal do Rio de Janeiro, Brazil and Australia's JKMRC. The need to reduce energy consumption and to achieve improved product quality has seen major shifts from the usual conservative approach in circuit design to more modern comminution circuits. Although comminution circuits have been advancing, classification has remained a major component of the comminution circuit design. The paper focused on the role of classification in different comminution circuits and the outcomes from four case studies carried out on plants operated with different circuit configurations showed that classification plays a key role in improving operational and energy efficiency of the circuits. An interesting paper from Separation Technologies (ST) on the separation of fine minerals using triboelectric separation was perhaps slightly out of place at a comminution conference, and I would like to hear more of this technique at Physical Separation '15. The ST triboelectric separator greatly expands the range of materials that can be beneficiated by electrostatic processes, which are limited in capacity due to the required contact of every particle to the drum or plate. The ST belt separator provides a means to treat fine material with an entirely dry technology, eliminating wet processing and required drying. It is suited to the separation of particles finer than 1 micron up to as coarse as 300 microns, with throughputs of up to 40 tonnes/h with energy consumption of only around 1 kWh/t. 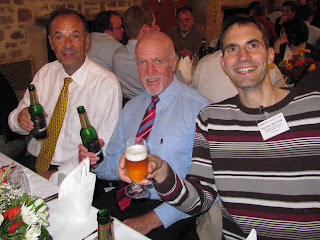 The afternoon got underway with a keynote lecture from one of the world's leading experts on DEM, CSIRO's Paul Cleary. The DEM method is ideally suited to predicting particle flows such as rock and media in SAG and media in ball and stirred mills, while the Smooth Particle Hydrodynamics method is well suited to splashing-free surface slurry flows as found in SAG mills. He presented a series of examples of mills and crushers, demonstrating the capabilities of these computational methods and the insights that they can assist in developing. The day concluded with papers on single particle stressing, dry grinding and classification modelling, as well as an afternoon of poster presentations. 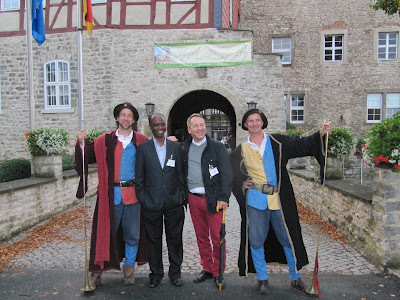 Then it was off to the 800 year old castle at Burg Warberg for a very memorable medieval banquet. The photos below (and on the posting of September 12th, as well as the YouTube video) are testament to a good time being had by all! After last night's dinner, where the wine, beer and mead flowed freely, there were a few bleary eyes and sore heads this morning. The morning's sessions covered mechanochemistry, particle breakage characteristics, particle bed stressing and new technologies. 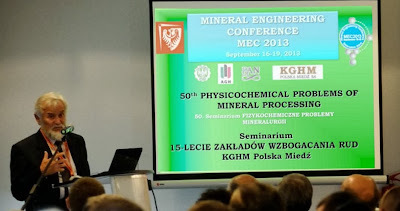 I was particularly interested in a presentation by Frank Shi of Australia's JKMRC who outlined the programme of work on electrical comminution by high voltage pulses which has led to a number of publications in Minerals Engineering over the last few years. Pre-weakening ore particles and preferential liberation of minerals at coarse sizes are the two major outcomes that may have potential benefits for the mineral industry. A novel particle pre-weakening characterisation method by single-particle/single pulse test has been developed in collaboration with the Swiss company selFrag AG. Dr. Shi discussed the emerging challenges to bring electrical comminution to the mineral industry, including scale-up for industrial application, hybrid circuit design, maximisation of pulse-induced cracks and study of the downstream processing effects. 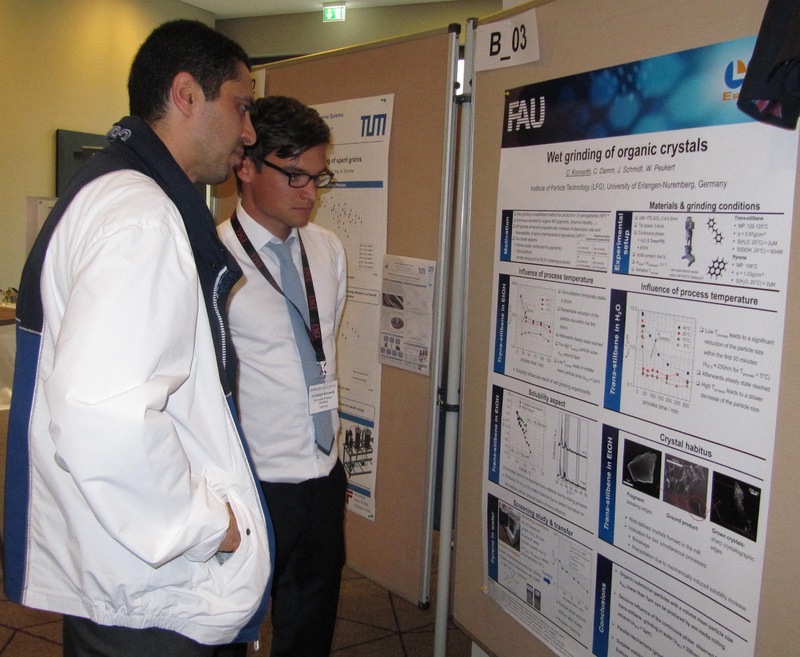 Following the afternoon sessions on Granular and Natural Materials, and Grinding Tests, Arno Kwade closed the conference and also announced the award of best poster. We must not forget that there were well over 50 poster presentations at the conference and contributing to the Proceedings volume and it was pleasing that the organising committee made an award for the best of these. 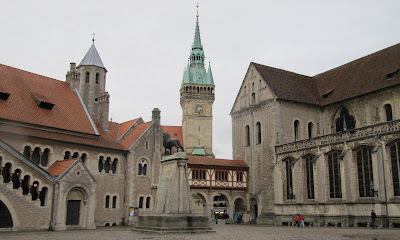 This was to Katharina Jacob of Friedrich-Schiller University Jena. 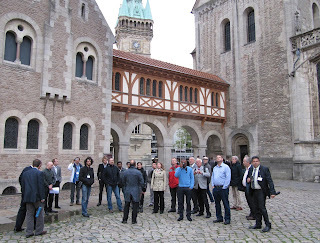 Following the official closing there was a very well attended optional tour of the very impressive facilities of the TU Braunschweig's Institute of Particle Technology. This has been a thoroughly worthwhile conference, and I will certainly be at the next one in Gothenburg, Sweden from September 7th-10th 2015. 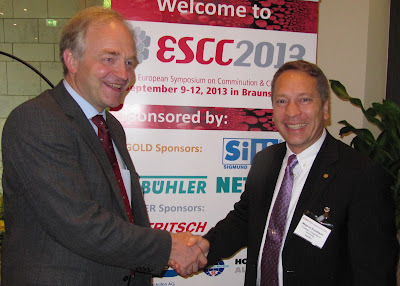 The chairman for ESCC '15 is Dr. Magnus Evertsson of Chalmers University of Technology, who is also a regular attendee and presenter at MEI's comminution series. We see no conflict whatsoever between the two conference series, and in fact will be working closely together to forge strong links between the two. I have found ESCC '13 to be a revelation- there are so many fine-grinding machines in use in various industries, many of which are completely alien to me. Although the main focus of ESCC is on relatively small-scale ultrafine grinding, many of the ideas behind these machines could be carried over into specific areas of the high tonnage minerals industry, in much the same way as the Netzsch stirred mill was adapted for a specific application in the minerals industry and became the IsaMill. Hopefully specialists from ESCC '13 will bring fresh ideas to Comminution '14 and Magnus and I will work on delegates in Cape Town in April, to convince them of the benefits of attending ESCC '15. A final thanks to Arno Kwade and his team for organising a remarkable event, memorable not only for its technical quality but also for its great social events, which consolidated existing relationships and made it easy to build new ones. I hope to see as many of you as possible in Cape Town in April, and a reminder that the deadline for Comminution '14 abstracts is the end of October. Comminution '14 in Cape Town in April looks like being the biggest in the series, with a record number of sponsors already. If you would like to present a paper at the meeting, short abstracts should be sent by email by the end of October. If your company would like to exhibit, details can also be found on the conference website.